The recent wind damage (26th April 2011 – see picture below) in the Central North Island affected hundreds of thousands of m³ of logs across various owners. In some areas the damage was severe with most stems being broken off but in many other areas damage was more minor. Recovery of wind damaged material swung into action immediately to minimise degrade due to sapstain. These windthrow events happen from time to time but, by and large, are conveniently forgotten in between. But what are the effects of such events on wood quality/properties? Are there internal stresses which do not result in the stem breaking but do cause internal rupturing and checking? How does this affect processing? Material from the recent wind event is still being processed and indeed quite dramatic internal defects are being encountered. The picture below shows an example of compression failure in a green board (the white lines going across the board) which only became apparent as the log was being sawn. 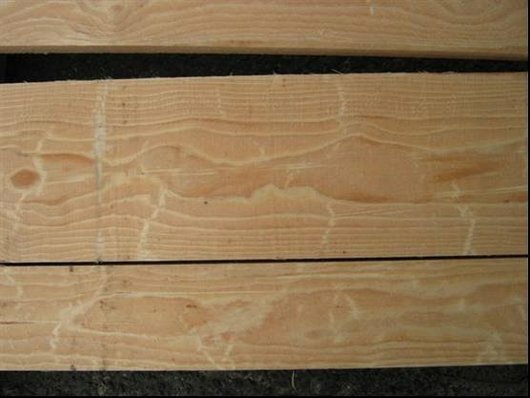 This defect can become less obvious in kiln-dried lumber but during manufacturing into structural or appearance products will cause problems such as loss of strength and problems with finishing. White lines going across the boards are compression failures. Then there is the question of what happens to younger trees that have been windthrow-stressed, not visibly damaged, and are left to grow to maturity? Will this internal stress damage affect end-use quality after processing? Whilst we cannot be sure, it is likely that resin will be released in response to the damage and the resulting resinous patches will add to processing issues and cause lumber degrade. SWI has looked into the effects of mechanical winching of stems to 40% of break point and shown that resin pockets (Type 1) are created by this winching. It is a reasonable bet that near-breaking wind effects will generate the same result and these resin pockets will ultimately be exposed in processing. For appearance applications this is a problem. 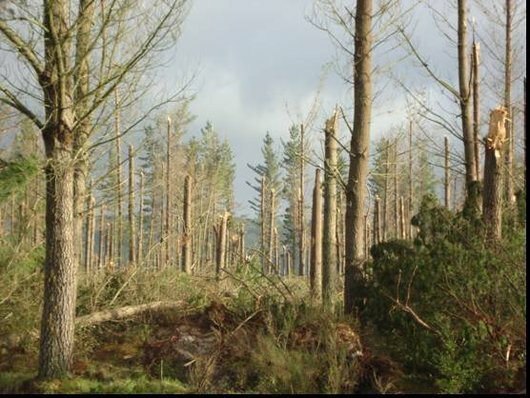 Whilst this is not good news for forest owners suffering from windthrow, this has important implications for management of windthrow log sales programmes and ensuring that logs of the appropriate quality are directed to the appropriate end-uses. that forest value is maintained as much as possible.